Water may seem like a simple Essential, but it is just as essential as food, perhaps even more so. Humans can survive about 40 days without food but only a few days without water. Let’s give the miracle of water its due respect. Water makes up about 70 percent of the human body and about 70 percent of the Earth’s surface. Blood plasma, about half the total volume of your blood, is 92 percent water. To be healthy, you must be hydrated. Dehydration causes premature aging, fatigue, and numerous other health problems. During political imprisonment, Dr. Fereydoon Batmanghelidj had no access to medicine, only water. He successfully treated 3,000 suffering prisoners using only water! His research revealed that dehydration is a major contributor to chronic disease. Urine color: Urine may be deep yellow upon awakening, but otherwise it should be clear to pale yellow. Darker urine is a sign of dehydration (unless taking “B vitamins,” which may make urine more yellow). Skin pinch test: Pinch skin on the back of your hand and hold for three seconds. Release. Ridge from pinch should be gone in less than a second; otherwise you are likely dehydrated. Tongue test: Rub the center of your tongue with your index finger. Tongue should feel smooth, like wet waxed paper. If it feels rough, you are dehydrated. The blood is pumped throughout the body by the heart, which circulates your blood, 24 hours a day, every day of your life. Blood carries oxygen and nutrition to all your cells, glands, tissues, muscles, and organs. The volume of lymphatic fluid in the body is almost three times greater than that of blood, yet most have never heard of the word. One function of lymph is to be the garbage collector in your body. Imagine what would happen if you kept bringing groceries into your house to eat, but you never took the trash out. Ewww. Lymph carries the waste it collects from all over the body to the four avenues of elimination to exit the body through: perspiration (skin), respiration (lungs), urination (kidneys), and defecation (bowels). There is no other natural avenue of elimination for the body to take out its trash. Pure, clean, fresh water used to be a given on this planet. Not anymore. Most people do not have a natural spring bubbling out of the ground in their yard. Clean city water is questionable with aging pipes and infrastructure nationwide. Chemical accidents and industrial pollution are rampant. The city of Flint, MI, recently in the news with dangerously high levels of lead (a highly toxic metal), sounded a wake-up call for the nation. The news now reports dangerously high levels of arsenic and other toxins in U.S. water supplies, even in well water. 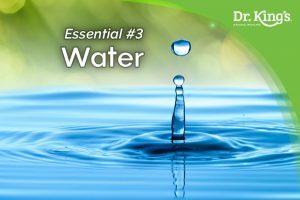 Get the best water purifier you can afford or buy natural spring water (read the label to be sure). Develop a taste for pure, clean water. Drink the equivalent every day of half of your body weight in ounces: if you weigh 160 lb., drink 80 ounces (or 10 eight-ounce cups) of pure water every day. Pure water; not including coffee, tea, milk, juice, and definitely not soda! If you “don’t like water,” as some say, try tapping a new program in. Use this TIP video and tap while saying phrases like, “I love the taste of pure water. I want to drink pure water. My body craves pure water. I enjoy drinking water every day.” Your body believes everything you say, so make sure you’re giving it healthy, self-empowering messages. In addition to drinking more water, here’s a secret to give your skin a youthful glow, help your kidneys, and improve your circulation: dry skin brushing. Obtain a long, wooden-handled, natural bristle, dry skin brush online or from a health food store (Google “Tampico dry skin brush” to see what they look like). Every morning, stand naked in your empty bathtub, and begin brushing your skin, dry. Begin with the bottom of one foot, then brush the top. Work your way around the ankle and progress up the leg. The lymph flows in every direction, so you don’t need to keep your strokes going in one direction. Brush both feet, the legs, the torso, both arms and hands, front and back, and brush your shoulders and back. Go in any direction you prefer, circular, back and forth, up and down, whatever, just brush. Use care with tender areas, never cause pain, and your body will begin to crave its daily brushing. The tiny skin flakes you shed will fall into the tub and be washed down the drain with your next shower. You can literally eliminate pounds of toxins this way, and your circulation and skin tone benefit as well. Enjoy the flow – and your healing journey!